"Yeah, we really want to do it. It's something we've been talking to DC Comics about and it's just a question of some political things, but also the actor's schedule. We're trying to work it out, but we don't know 100 percent if it's going to happen, but we're really optimistic and we would love to have him." While he isn't specifically mentioned by name, it is believed that Wendy Mericle was referring to Matt Ryan, who played John Constantine on the short-lived NBC series. If it does happen, it would certainly be a unique crossover, simply because Constantine isn't on the air anymore. Just a few days after Stephen Amell revealed he would guest star on Constantine, the actor confirmed that he actually had discussions with DC about crossing over to the NBC series, which could pave the way for Matt Ryan to appear on Arrow. Here's what he had to say during an appearance at the Wizard World Philly convention in May. "There is an opportunity for interconnectivity with any DC television show that exists. Like, as an example, yesterday Constantine was cancelled. I know, it's brutal... It's a good show, and it should come back. And it may come back, like there are various platforms where it could come back. Constantine is an NBC show, I'm on the CW. I had discussions with DC Comics -- not NBC or the CW -- DC Entertainment about guest starring on Constantine when it was on the air. That was and is on the table. The reason that I was going to guest star on Constantine, at least the idea that we were throwing around, was [Constantine's] an expert when it comes to the Lazarus Pit, which is now something that is a part of, and will continue to be a part of, Arrow." As of now, there is very little we know about Arrow Season 4, except that Neal McDonough was recently cast as the season's main villain, Damien Dahrk, and both Arrow and Diggle (David Ramsey) will get new costumes. Arrow Season 3 ended with Oliver leaving Starling City with Felicity (Emily Bett Rickards), while Malcolm Merlyn (John Barrowman) took over as the new Ra's al Ghul. We'll have to wait and see how the Lazarus Pit comes into play this season, but we know it will also be featured in the spinoff DC's Legends of Tomorrow, since this is how Caity Lotz's Sara Lance, a.k.a. Black Canary, was brought back from the dead and transformed into the White Canary. 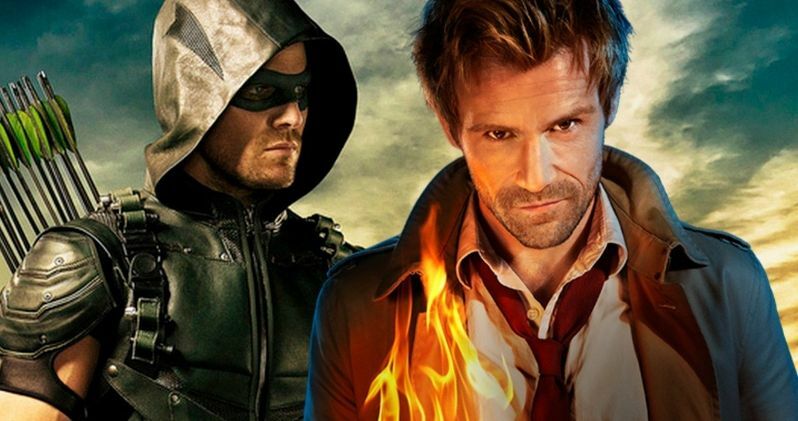 Would you like to see Constantine pop up on Arrow this season?